We are not immune to hope. Regardless of your circumstances, you will find a whisper of hope. We must find this hope in every aspect of our lives. If there’s any topic I want to petition it would be in contending for the richness of living a hope-filled life. Hope is what takes us out of muck and chaos. Hope is what drives us to rise above our challenges. How many of these phrases have you thought or said over the course of your life? Take inventory. If your hope has waned, reclaim it today. Why? Because hope is a cup of cold water quenching your thirst. Ensure hope is in the rhythm of your daily life. It is a gift for you. Here are few examples of what hope offers. Gratitude: Find what you’re grateful for. Encouragement: Ask someone for encouraging words. Community: Lean on others and they will prop you up. Love: Love conquers all doubt. Receive love from loving people. 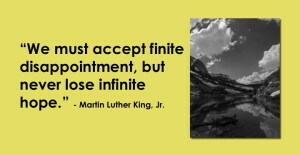 Acceptance: Let go of needing to know the outcome. Ride the wave. Expectancy: Open yourself up to what might be possible. Clarity: Find what you truly value and what you deeply desire. Vision: Illuminate your eyes to see something bigger than yourself. Trust: Know that something good is waiting for you. Wonder: Believe like a child. Learn like a child. Trust like a child. This all belongs to you. Every day. And one more thing, when you surround yourself with hope-filled people, they are contagious.